11 chefs on their favorite way to use rhubarb. Strawberries aren't the only pairing for this pretty pink perennial. It’s primetime for rhubarb right now, and we couldn't be happier about it. The vibrant pink and green vegetable, which is often treated as a fruit, goes as well in savory dishes as it does in sweet ones — whether pie filling or saucy topping. 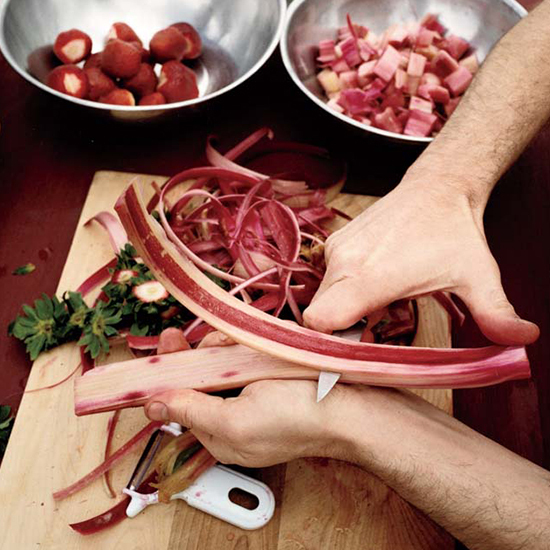 This spring, chefs across the country are cooking rhubarb in all sorts of different ways. From dehydrating the stalks into natural jelly candies to creating a bright rhubarb sorbet, there's so much recipe inspo that we wish rhubarb season could be just a little bit longer (or a lot). But for now, we'll do our best to take advantage while the pretty perennial is still available. "I love to stew rhubarb slightly in sugar, orange, vanilla, star anise, and black peppercorns. The key is to let it chill in the cooler right after you cook it. The red color bleeds out and makes it vibrant." "I plan to treat rhubarb as a tomatillo and roast it, then make a base for an aquachile to lightly cure a fluke dish with other seasonal spring ingredients." "I don't think I will ever get over the way that rhubarb plays with strawberries. I know there is nothing groundbreaking about this flavor combination but they are a match made in heaven. I chop them up and throw them in a pie or crumble." 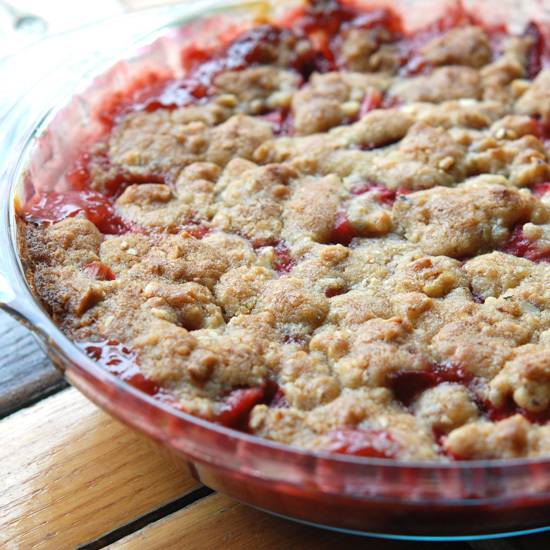 Try this recipe for a strawberry-rhubarb crumble. "I like to cook them by cleaning them, then soaking them in pickling lime for a few hours, rinse, then cook in sugar syrup and dehydrate. They turn into natural fruit jelly candies. Super good." "I like cutting rhubarb into chunks and then cooking it in a light sugar syrup, but not enough to lose its shape. I drain the syrup (which I also save because you end up with a lovely, pink rhubarb syrup) then dehydrate the candied rhubarb pieces for a few hours, just until chewy on the outside but soft in the inside. I also put rhubarb directly on a grate close to a hot fire so it gets a nice char, while getting a little smokey. The hearth at Elske is completely heated by wood and it gives fruits the most delicious, mellow smoked flavor. I cut the charred rhubarb up and toss with granulated sugar. It's not enough sugar to make the rhubarb too sweet, but it will cook up bright pink and cut the very acidic nature of rhubarb." 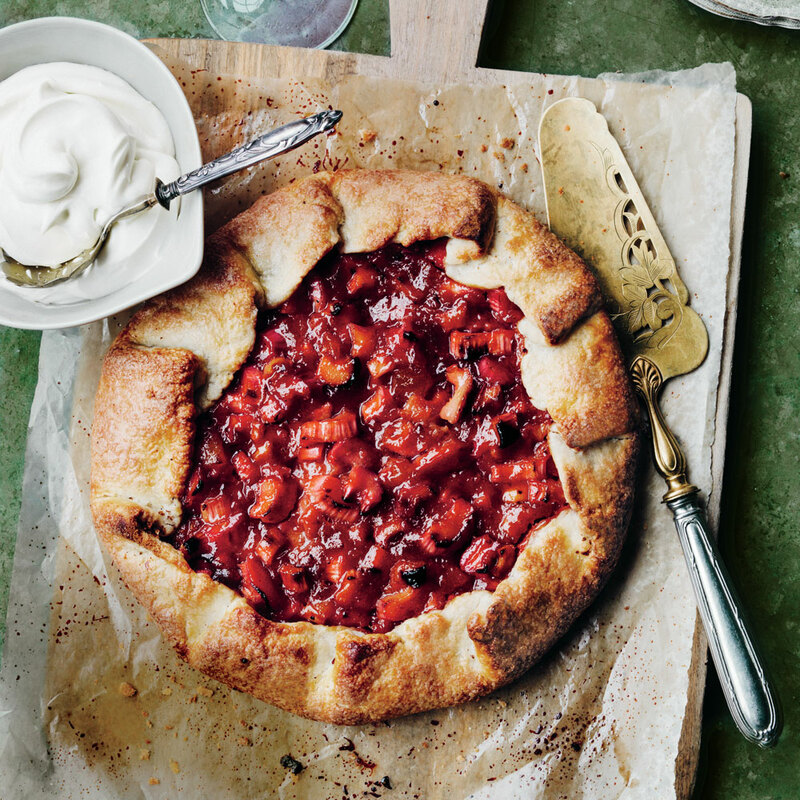 "I like to use rhubarb in form of a syrup — rhubarb and strawberry glaze. Love to drizzle it over some hot beignets right out of the fryer." 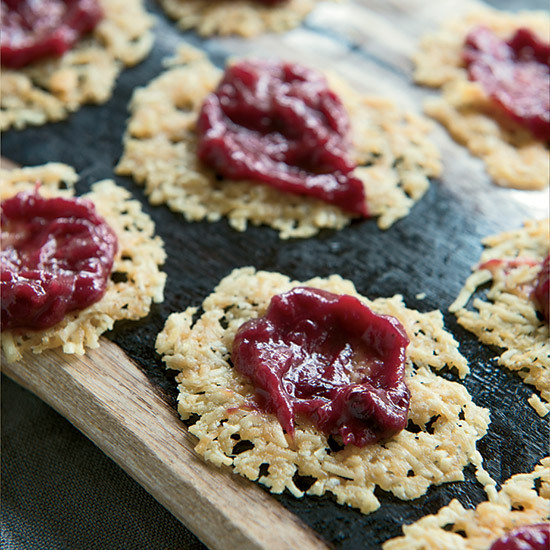 For a savory twist, try these pecorino crisps with rhubarb-cherry marmalade. "I love using rhubarb to make a fruity and tart granola! When mixed with sweet berries and different nuts and seeds, the rhubarb pops in a lovely way." "We're testing a recipe that features a savory unsweetened rhubarb, white chocolate, and Creole cream cheese truffle that we'll roll into a buttermilk beignet batter and fry to make very crisp. The result will be a molten, stuffed, gooey New Orleans donut that has laser sharp acidity and two textures. It will be the perfect foil for cast iron-seared foie gras and rum-spiked strawberry molasses." "I plan on making a brown sugar rhubarb pie with lots of chopped rhubarb and a few eggs and a tiny bit of cream to make it a little custardy. I also love rhubarb in a simple muffin with raspberries. Or in a slab pie — a little more freeform than a standard round pie with a lot of butter streusel on top." 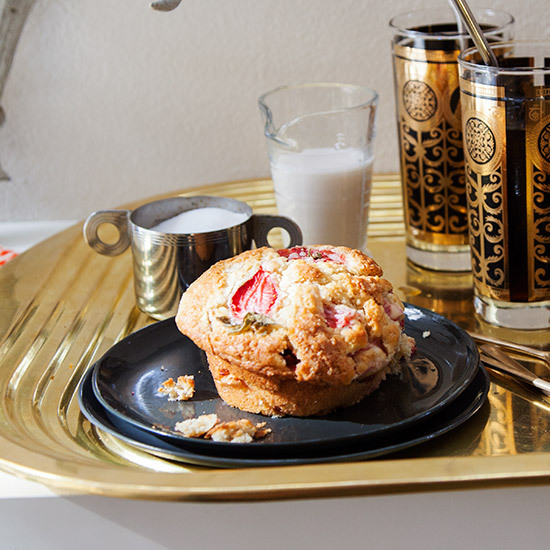 Try this recipe for jumbo strawberry-and-rhubarb muffins (or make like Joanne Chang and substitute with raspberries!). "Lightly poached and served with foie gras and pistachios." "We are making brioche tartlets, filled with a layer of rhubarb jam on the bottom, then filled with vanilla custard, and bruleed on top. I love rhubarb sorbet so much! I love being able to just barely cook the rhubarb to maintain a very fresh, bright flavor, or choosing to cook it further for a rounded, jammy taste. Either way, rhubarb sorbet packs a vibrant punch on the plate." What's your favorite way to cook with rhubarb? Tell us by tagging us at @foodandwine.